A small next-gen device for controlling LED lighting by a subtle movement of your hand, without touching the surface. Why is SDS better than other alternatives? Subscribe to stay updated about latest products and sales! 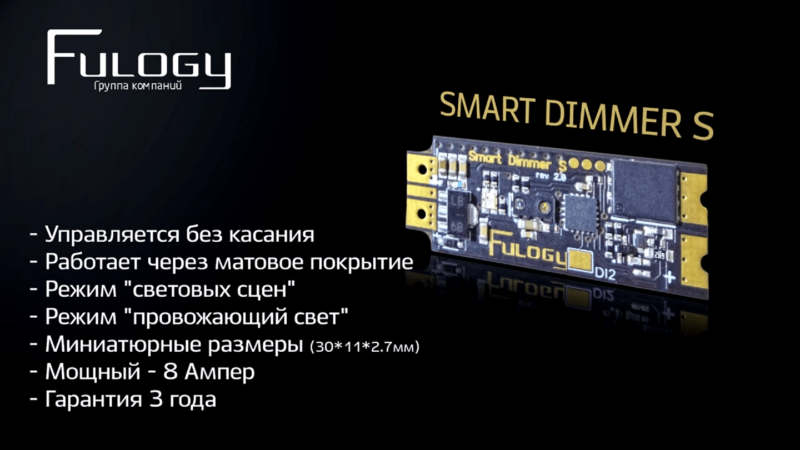 Smart Dimmer S is a device that provides various scenarios for its application. The basic use of the dimmer is to smoothly switch the device on and off and adjust the brightness without touching the sensor surface with a subtle movement of your hand. 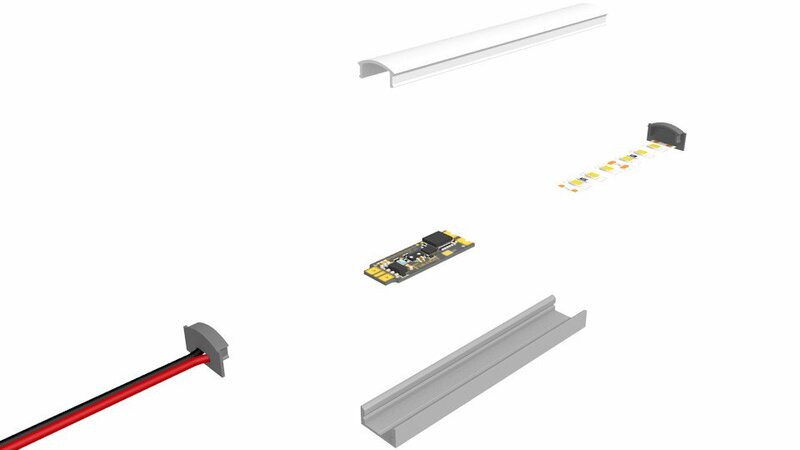 There is also an option to connect any kinds of external motion sensors and switches to the device, which extends its functionality and allows for performance of wide range of tasks in lighting design. Thanks to contactless control, it can be used in situations where it is necessary to minimize hand contact with any lighting devices, which, without a doubt, positively affects hygiene, comfort and safety, thus improving living standards. 02.places of temporary visit: halls, entryways, dressing rooms, staircases and bathrooms. 03.control of basic lighting in the room with a switcher. Installation into small and hard-to-reach places thanks to the small size of Smart Dimmer S.
We took into account all possible Smart Dimmer S applications. All options and functions can be easily adjusted to your personal needs. Smooth switching on and off. You can adjust the smoothness of on/off switching. On/off switching of built-in RGB indicator. Enables to leave the room with insufficient illumination comfortably. You can regulate the duration of "polite" illumination and the brightness level to turn on this mode. Possibility to connect external switches and motion sensors. The delay of switching and the brightness of the motion sensor are adjustable. Warning before switching off mode. If motion sensor is connected to Smart Dimmer S, the light source will warn about switching off by blinking 2 times for briefly 3 seconds before the light is completely turned off. Smooth on/off switching of three lighting scenes. For quick brightness control. Default settings: Scene 1 - 100% brightness, Scene 2 - 50%, Scene 3 - 25%. You can quicky set the brightness for each scene or you can turn off the lighting scenes mode. The PWM frequency Is a very important characteristic which affects the quality of light. We take care of our clients' safety, that is why Smart Dimmer S works at 10,000 Hz frequency. That is more than enough to beat all the competitors and show the unequalled quality of lighting which keeps your eyes fresh and healthy. We do not want your joy from buying SMART DIMMER S to go away during installation and use, that is why we considered all the possible protection options, which will keep you satisfied and secure your investments into Smart Dimmer S. Protection against short circuit, overheat and reverse polarity will keep Smart Dimmer S safe and sound for many years. We wish to save your energy and worries, that is why we did our best to make the installation of Smart Dimmer S as simple as possible. Smart Dimmer S design is thought out so well, that even if it is your first time, you will be able to do that like a professional. Have a look at how simple that is. You can order a ready-made light fixture with Smart Dimmer S already installed, if you want to save time on dimmer installation. Just take a look at the user-friendly constructor on our webpage constructor.fulogy.com or order from our dealers and recommended installation companies.